Rhossili Bay is the most westerly bay on the Gower peninsula and bears the full might of the Atlantic swells. 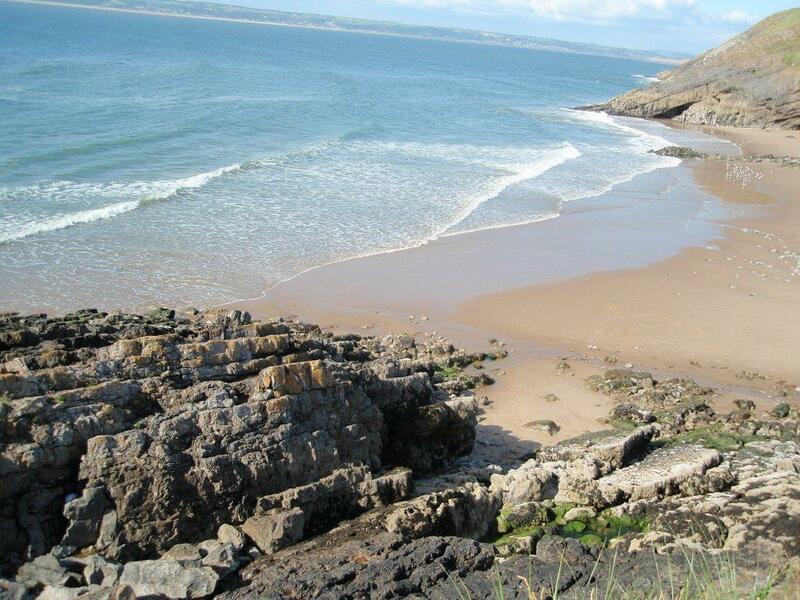 It is the most consistent surfing beach on Gower, with the biggest waves at the north end at Llangennith. It is a dramatic environment with Rhossili Downs towering above the vast expanse of beach that stretches four miles. Heading west along the cliff path towards the end of the peninsula there is Worm's Head, a mile long serpent-like promontory jutting out into the ocean. For spectacular panoramic views over the bay, walk out of the car park at Rhossili going towards the sea, but staying on the Downs. Leaving the Bay behind you to your right, you can walk around the coastline on a well worn coastal path. There is a National Trust Visitors Centre though this was closed when I did the walk. As you walk along the coastal path high up on Rhossili Downs, the views will take your breath away, but the wonderful sea air will soon fill your lungs again. This is a lovely alternate walk to just going along the bay itself and dogs love charging up and down and all around. Also there are lots of small prettily coloured snails. This is not mentioned on any guides, but is of interest to me as I used to collect the yellow and black striped snails and the orange and black striped snails when I was a child. As these are quite hard to find, compared with the numerous large brown garden snails, I was astounded by how many of these coloured snails I could find on the Down. I grew out of collecting them when I was ten or thereabouts so the snails remain on the Down!